Andhra Pradesh State Directorate of Government Examinations (BSEAP) has Started distribution of Nominal Rolls to the state Class 10th of Secondary School Certificate (SSC) Annual final March Public Examination Tests to the academic year of 2019. According to the reports the SSC public examination test fee practicals are successfully completed with late fee charges also. The BSEAP has started distribution of AP SSC Hall Ticket 2019 to all government and private schools for all eligible regular and private course general and vocational students, the AP SSC /10th Hall Ticket 2019 distribution is started to all schools across in the state. Directorate of Government Examinations is started distribution of hall tickets to all government and private schools at all 13 districts in the state, and the school headmaster will issue to all eligible students in before 10 days of examination schedule. 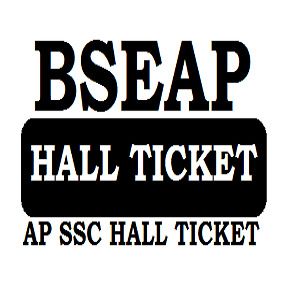 Every student can get their Original AP SSC Hall Ticket 2019 in before March 2019 exams through their studying school headmaster or principal, and this is the AP 10th Original Hall Ticket 2019 printed by BSEAP. The student who has not able to get by their school headmaster or anyone can lose or forgotten their Original hall ticket they can download online from the BSEAP Official website, and the AP 10th Hall Ticket 2019 Download available before 10 days of examination schedule and the service available up to end of the examination tests. Now Take a copy of printout and read the instructions carefully, before attend of March final Examination test the student can get an authentication from their respectable school headmaster to validate it is also original for the annual final public examination tests 2019. The Student who have issued their SSC hall ticket 2019 with mistakes or errors they can get duplicate hall ticket from Board of Secondary Education, Amaravathi. The Students who have received their hall ticket with mistakes they can immediately contact to their school headmaster with supported documents and report the issue, the headmaster will apply to modification of 10th Hall Ticket to BSEAP to re issue new hall ticket without errors, other wise there is no possible to get AP 10th Duplicate Hall Ticket 2019.
the Directorate of Government Examinations (BSEAP) isued AP SSC /10th Class Hall Ticket 2019 is maintained all details of the public examination test with complete schedule with subject wise exam dates, student applicable course like general, OSSC, Vocational and student type like regular, private or reappear external along allotted examination test center venue details to the March annual final public examination tests 2019. Every Student can check their AP 10th Exam Center Details 2019 at their printable copy of AP SSC Hall Ticket 2019.